Preheat an oven to 450 degrees F (230 degrees C). Grease a baking sheet. Mix biscuit mix, Cheddar cheese, and milk together in a bowl using a wooden spoon until batter is soft and doughy, 30 seconds. Drop spoonfuls of batter onto the prepared baking sheet. Bake in the preheated oven until biscuits are lightly browned and cooked through, 8 to 10 minutes. Heat butter and garlic powder in a saucepan over low heat until melted, about 5 minutes. 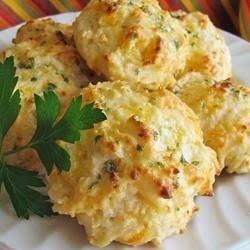 Brush garlic butter over cooked biscuits.